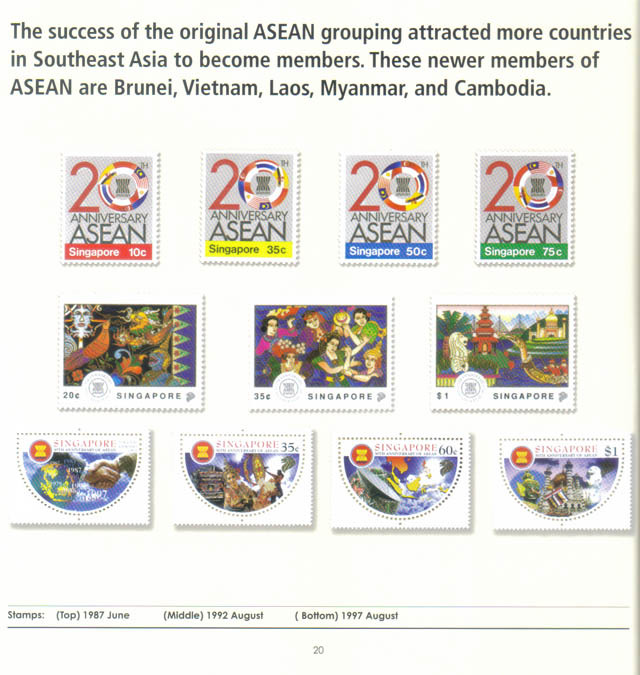 The success of the original ASEAN grouping attracted more countries in Southeast Asia to become members. These newer members of ASEAN are Brunei, Vietnam, Laos, Myanmar, and Cambodia. 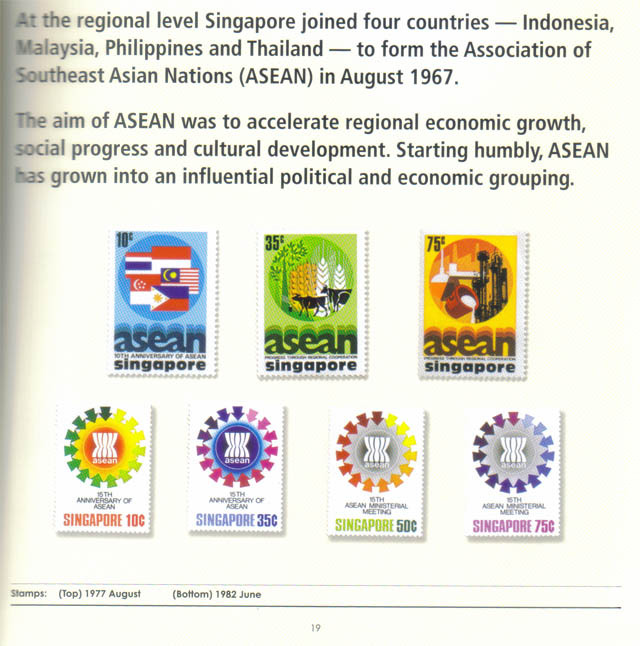 At the regional level Singapore joined four countries – Indonesia, Malaysia, Philippines and Thailand – to form the Association of Southeast Asian Nations (ASEAN) in August 1967. The aim of ASEAN was to accelerate regional economic growth, social progress and cultural development. Starting humbly, ASEAN has grown into an influential political and economic grouping. With independence, Singapore needed support and recognition from other countries. Consequently, Singapore moved quickly to seek membership in the United Nations and the British Commonwealth. On 21 September 1965, Singapore was accepted as the 117th member of the United Nations. 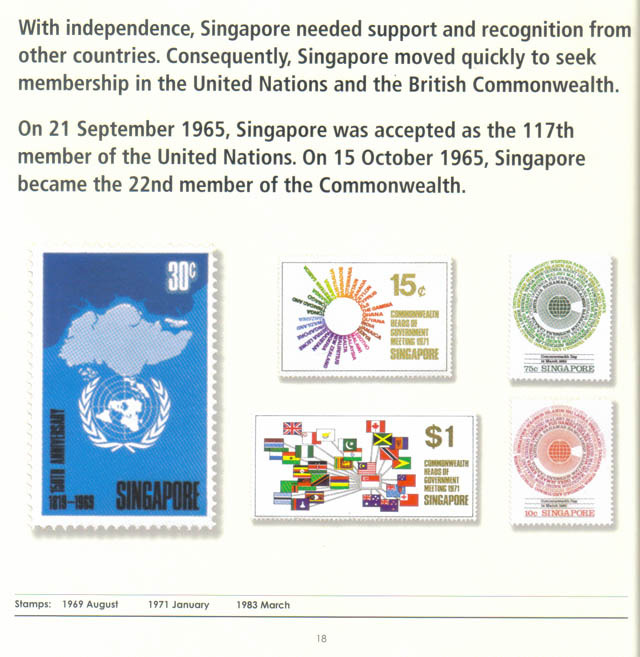 On 15 October 1965, Singapore became the 22nd member of the Commonwealth. An independent nation issues its own stamps. 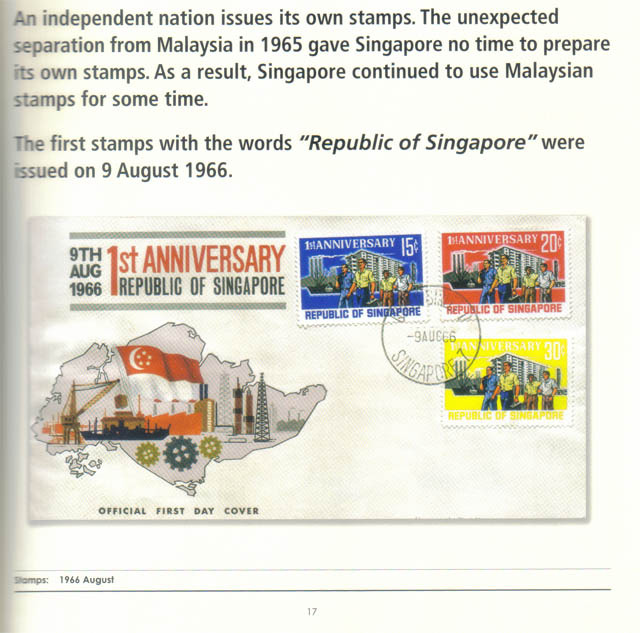 The unexpected separation from Malaysia in 1965 gave Singapore no time to prepare its own stamps. As a result, Singapore continued to use Malaysian stamps for some time. The first stamps with the words “Republic of Singapore” were issued on 9 August 1966. However, there was strong disagreement between Malaya and Singapore on various policies. In August 1964, the tension sparked a riot in Singapore in which 23 people were killed. 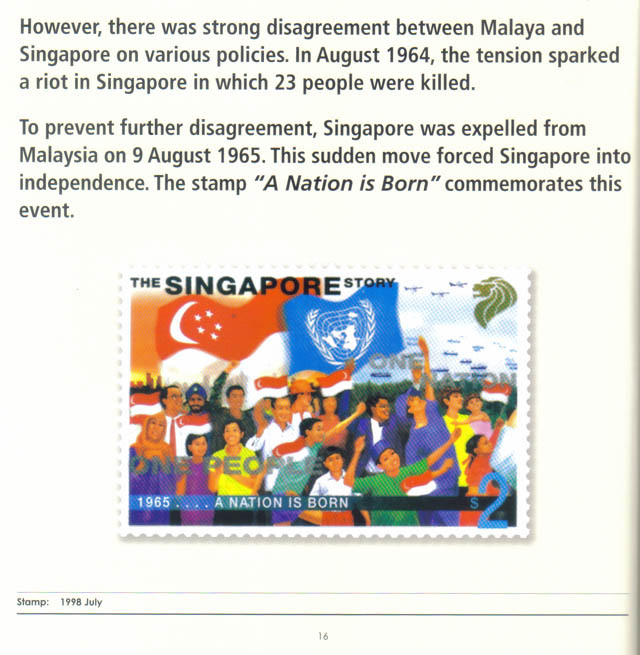 To prevent further disagreement, Singapore was expelled from Malaysia on 9 August 1965. This sudden move forced Singapore into independence. The stamp “A Nation is Born” commemorates this event. 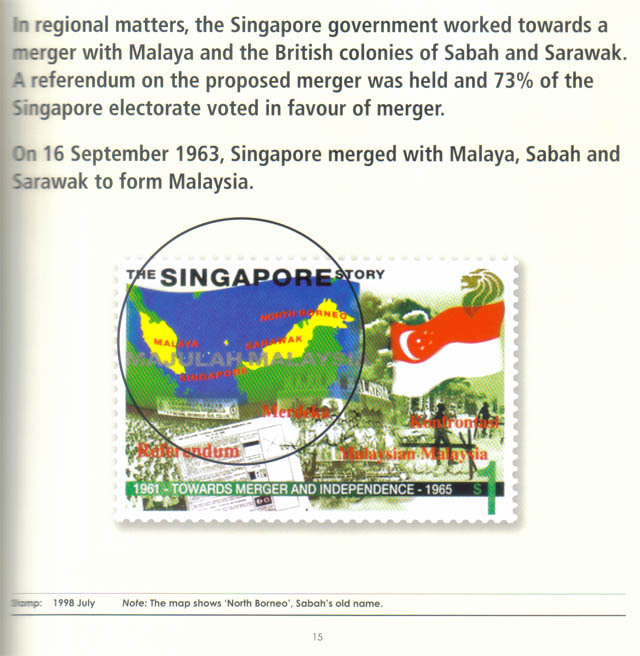 In regional matters, the Singapore government worked towards a merger with Malaya and the British colonies of Sabah and Sarawak. A referendum on the proposed merger was held and 73% of the Singapore electorate voted in favour of the merger. On 16 September 1963, Singapore merged with Malaya, Sabah and Sarawak to form Malaysia. To improve understanding between workers and employers, and to avoid a resurgence of the strikes of the 1950s, the National Trade Unions Congress (NTUC) was formed in 1961. 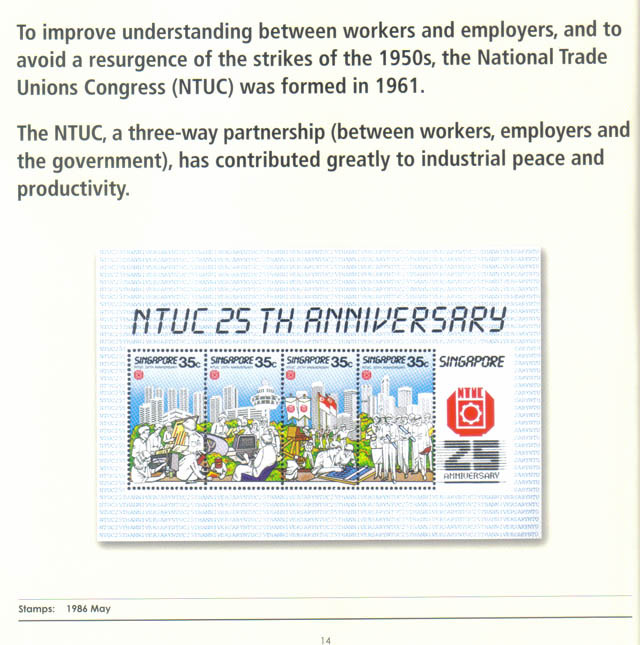 The NTUC, a three-way partnership (between workers, employers and the government), has contributed greatly to industrial peace and productivity.